DUKE vs NOTRE DAME 2 Pm , Follow game on the FREE App , LAXTOPIA ! Notre Dame men’s lacrosse: Irish reach manifest destiny ! 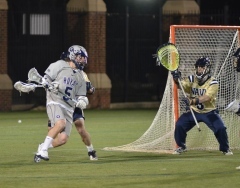 MEN’S LACROSSE | Undefeated Irish Edge Hoyas..